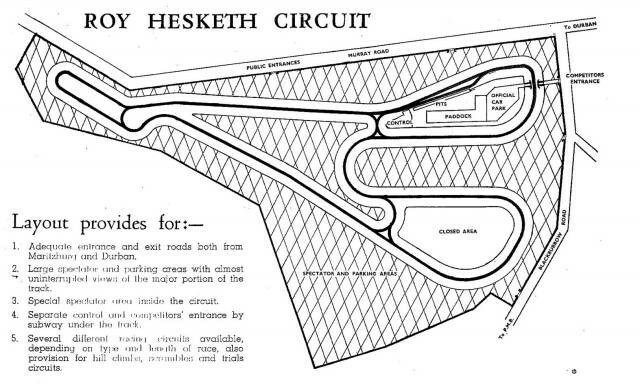 circuit was no longer used after the opening of the permanent Roy Hesketh Circuit in 1953.
maintain and improve the circuit. ( Above) Alexandra Park Street Circuit. 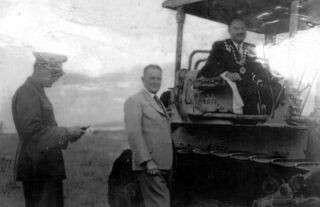 (Left) Pietermaritzburg Mayor D.R.Warmback, turning the sod for the proposed Roy Hesketh Circuit at the Hay Paddock site, Mr Oliver Hesketh in the centre with Traffic Police officer Joe Turner to the left 1952. 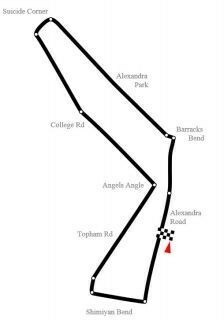 During its period of operation (1953-1981) it hosted rounds of the South African National Drivers Championship, and national Formula Atlantic races. The circuit also hosted the Easter races - a festival of racing over three days. Mike Hailwood, Giacomo Agostini, Barry Sheene, Kork Ballington, Jim Redman, Paddy Driver, Mike Grant, Rod Gray and Syd Stacy were regular competitors at the circuit as wereJohn Love, Jackie Pretorius, Sam Tingle and Ian Scheckter. In 1973 the South African government banned all motorsport due to the world oil crisis, the circuit went into decline and finally closed in 1981 after only 28 years. The expansion of the town of Pietermaritzburg eventually led to the redevelopment of the site as a residential and business zone after racing ceased at the end of 1981. South Africa has played an important part in world motorsports history, but its heritage sites are under threat. Roy Hesketh was lost, the classic version of Kyalami is no more, and now it’s the turn of East London to face the threat of closure by modern officialdom with no appreciation of its heritage. 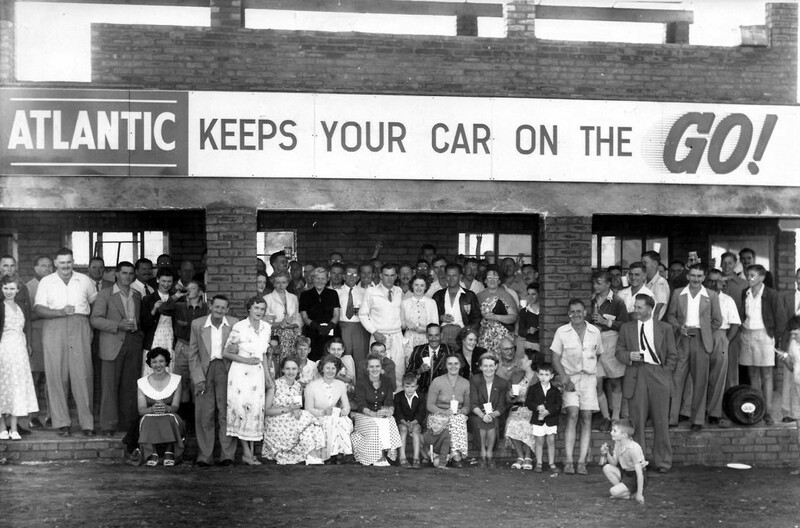 During its period of operation it hosted rounds of the South African National Drivers Championship, the Springbok sports car series and national Formula Atlantic races. The circuit was also like a second home to Mike Hailwood. The Golden Age of Motor Racing was brought to an abrupt halt in 1973 when the first OPEC oil crisis resulted in the then South African government banning all forms of motorsport. Memories of the Roy Hesketh motor racing circuit were revived on Easter Saturday 2002 with a display of motorcycles and cars that competed there between 1953 and its closure in 1981. The last race meeting was at Easter 1981, following a decision by PMB city council not to extend the lease after the area had been earmarked for residential development. In January 2004 the circuit was sold to the Roy Hesketh Motor Racing Foundation for R 3,250,000. with strict development conditions attached to the sale. In 2013 the property was put up for sale for 1.5M ZAR due to the Roy Hesketh Motor Racing Foundation allegedly defaulting on the previous sale conditions. the greed of the local council was evident in this sale.It now seems that the one great motor racing venue will disappear forever under a housing development. In the map you can still see the remaining section of the track. The neighbourhood of Hayfields has now expanded onto the Circuit. 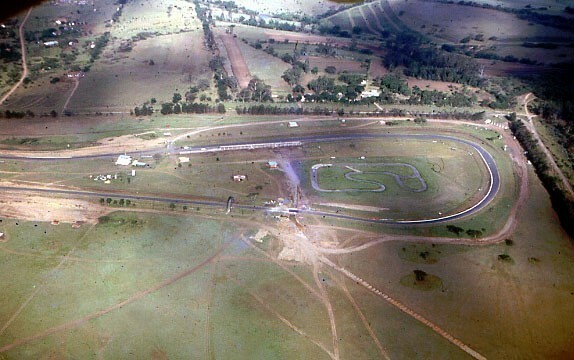 The track was famous for hosting the Easter races as well as festival of racing over three days. The expansion of the town of Pietermaritzburg eventually led to the redevelopment of the site as a residential and business zone after racing ceased at the end of 1981. The section from Henry's Knee to the top of Beacon still exists, and is undergoing protection from further development as an important piece of Pietermaritzburg's history. Pietermaritzburg holds a small slice of history: the circuit was the host of the first ever 3 litre F1 race in 1961, when Bruce Johnstone triumphed in a Cooper Alfa Romeo in the Pat Fairfield Trophy. The circuit is now disused. 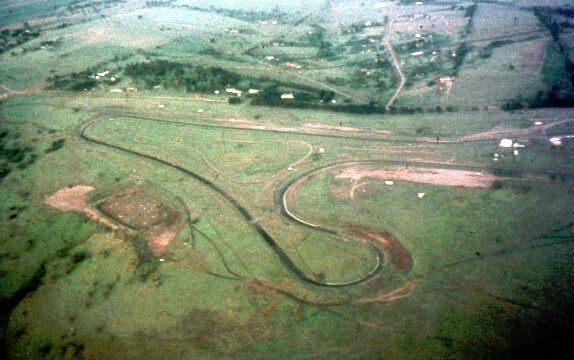 (Above) Aerial view of the circuit showing the Stock Car Dust Bowl is to the left of the main track (Below) The Karting track within the main track circuit. 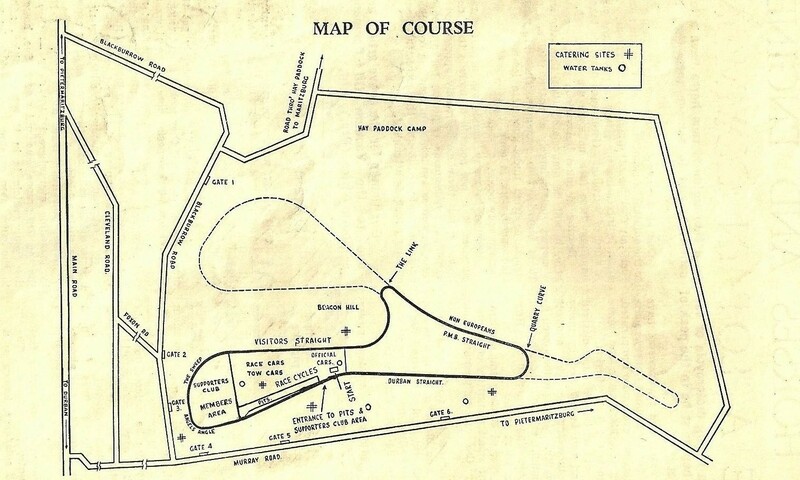 (Left) Original circuit plans from 1952. 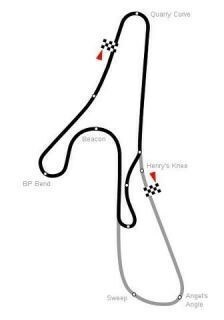 (Below) Plans for the circuit in 1953, showing the planned loop which never materialised. Image from 1953 Inaugural race meeting programme. 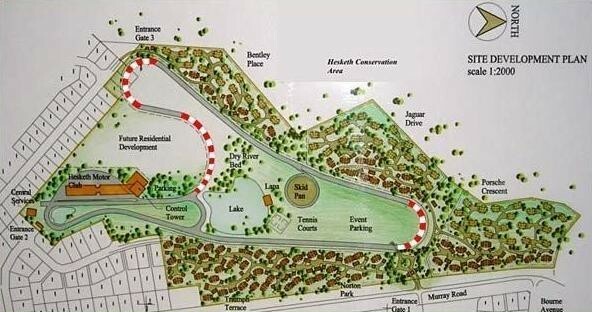 (Left) In January 2004 the circuit was sold to the Roy Hesketh Motor Racing Foundation with strict development conditions attached to the sale as seen on the plans. 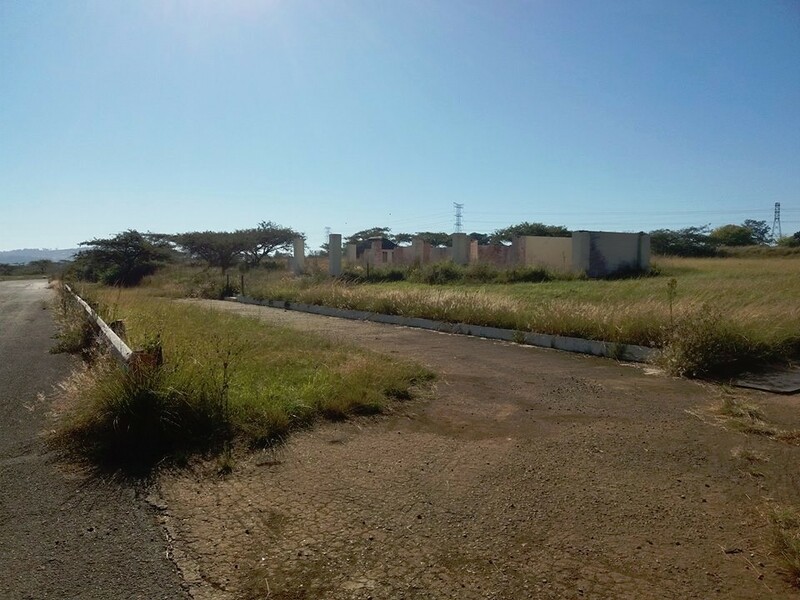 In 2013 the property was put up for sale for 1.5M ZAR due to the Roy Hesketh Motor Racing Foundation defaulting on the previous sale conditions. (Centre) Roy Hesketh Circuit 2005. (Far left) Roy Hesketh Circuit in 2012. (Above) The old pits entrance in 2014. (Below left)The sad remains of the vandalised Clubhouse 2018. (Below) Main straight down to Quarry Curve 2018. The sport went into decline in the late 70s and the circuit closed for good in 1981. Dave Hiron an ex UK speedway rider and hard working secretary for stock car and motorcycle dirt racing arranged motorcycle racing on the stock car track. Dave Hiron was seriously injured when accidentally run down by a rider while officiating, after a long recovery period worked tirelessly behind the scenes to make dirt bikes a success in the 1970s. Riders of that time include: S.A. champion, Les Smith, Eddie English, Arthur Arpin and the Bergstrom brothers. Blackie Blackman, John White, Neville Flint and Alf Ford and many other raced at the Karting track built on the inside of the main racing circuit. Arthur Eggar won the Natal Championship in 1976 and awarded the Natal Colours. The section from Henry's Knee to the top of Beacon still exists, and is undergoing protection from further development as an important piece of Pietermaritzburg's history. 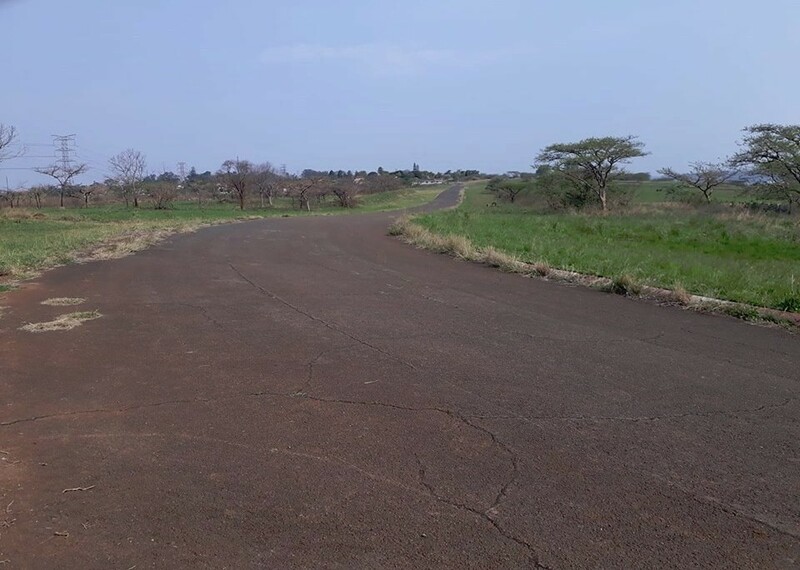 Pietermaritzburg holds a small slice of history: the circuit was the host of the first ever 3 litre F1 race in 1961, when Bruce Johnstone triumphed in a Cooper Alfa Romeo in the Pat Fairfield Trophy. The circuit is now disused. South Africa has played an important part in world motorsports history, but its heritage sites are under threat. Roy Hesketh was lost, the classic version of Kyalami is no more, and now it’s the turn of East London to face the threat of closure by modern officialdom with no appreciation of its heritage. The Golden Age of Motor Racing was brought to an abrupt halt in 1973 when the first OPEC oil crisis resulted in the then South African Government banning all forms of motorsport. Memories of the Roy Hesketh motor racing circuit were revived on Easter Saturday 2002 with a display of motorcycles and cars that competed there between 1953 and its closure in 1981. The last race meeting was at Easter 1981, following a decision by PMB city council not to extend the lease after the area had been earmarked for residential development. In January 2004 the circuit was sold to the Roy Hesketh Motor Racing Foundation for R 3,250,000. with strict development conditions attached to the sale. 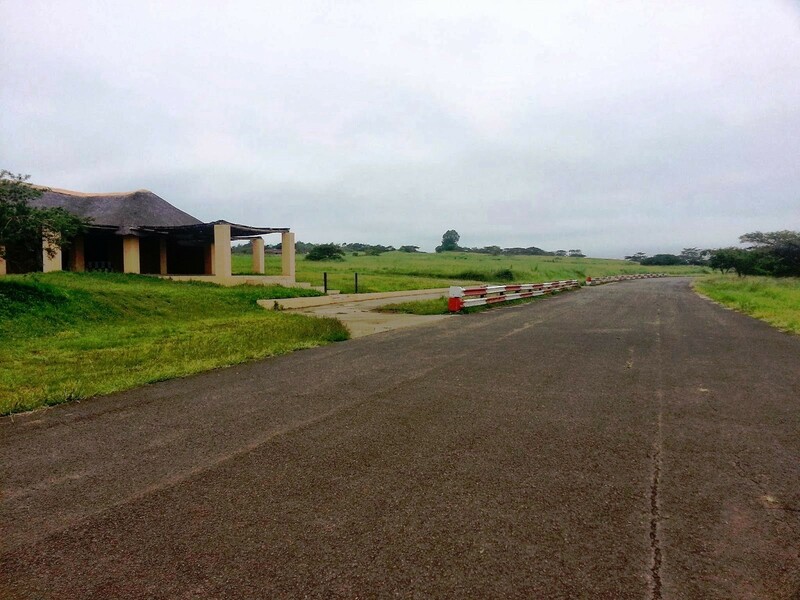 In 2013 the property was put up for sale for 1.5M ZAR due to the poorly run Roy Hesketh Motor Racing Foundation by Mike Fogg allegedly defaulting on the previous sale conditions, and soon the race track. 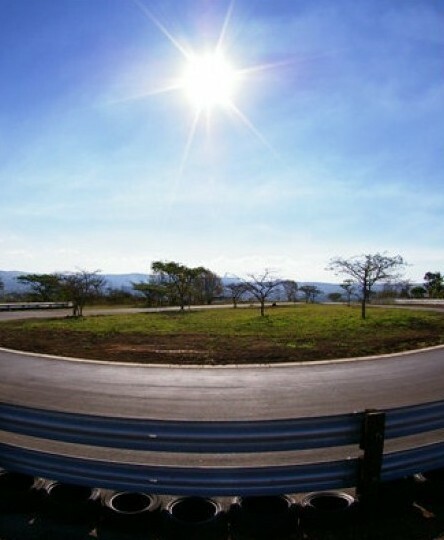 A part of racing history in Kwazulu Natal will be no more, a sad day in the history of this once great circuit.